A full DIY kit for a 2-pole multimode filter reminiscent of the classic ‘SEM’ style state variable VCF. Special features include a hot rodded resonance circuit and increased frequency range. A PCB set for a 2-pole multimode filter reminiscent of the classic 'SEM' style state variable VCF. Special features include a hot rodded resonance circuit and increased frequency range. 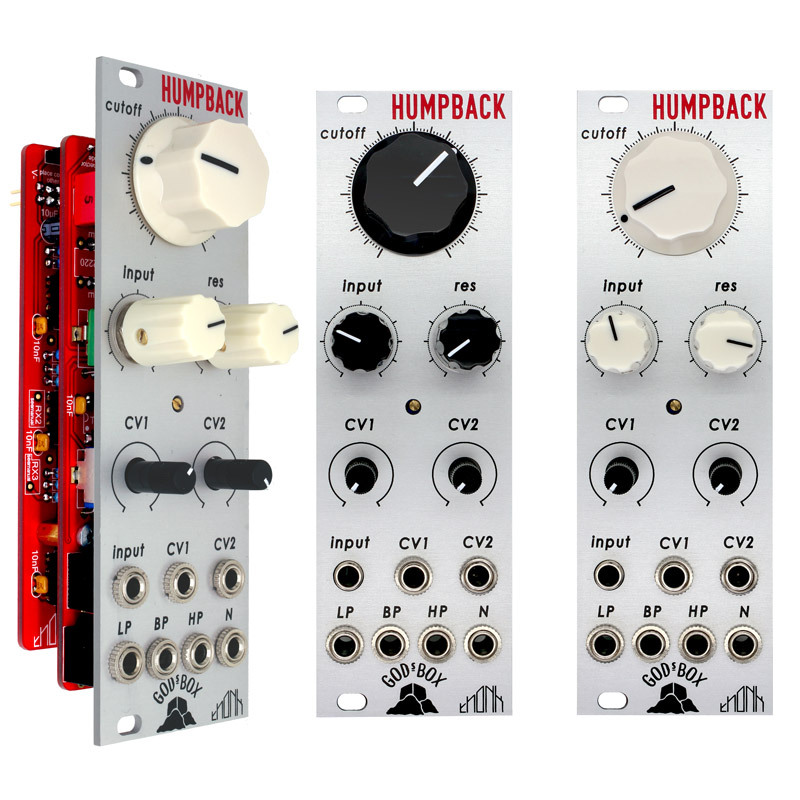 A Eurorack Panel for a 2-pole multimode filter reminiscent of the classic 'SEM' style state variable VCF. Special features include a hot rodded resonance circuit and increased frequency range. A parts kit (not including Panel and PCB) for a 2-pole multimode filter reminiscent of the classic 'SEM' style state variable VCF. Special features include a hot rodded resonance circuit and increased frequency range. 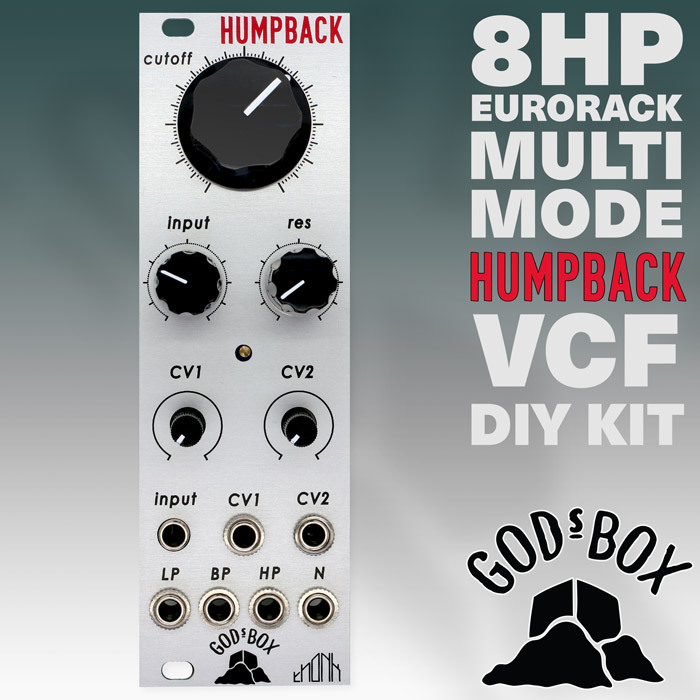 The God’s Box ‘Humpback’ kit is produced exclusively in collaboration with Thonk. This kit includes everything you need to build the module apart from tools and solder. The module is 8hp wide and is skiff friendly; 38mm deep. The kit is packed to the same high standards customers have come to expect from all Thonk kits. CV inputs – two frequency CV inputs are included on the panel and controlled by attenutators. 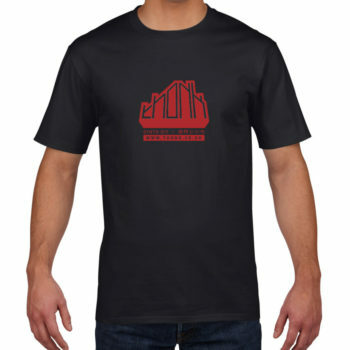 Resonance-resonance control is included and is hot-rodded to allow self-oscillation. In self oscillation the filter will produce a sine wave output.